Now I have my primary blog on Wordpress, I keep forgetting to come over to the Blogger dashboard and upload piccies to the Blogger blogs ... I'm not updating with the latest ornies I've stitched since my last update in January - I have stitched an ornie every month, just keep forgetting to post! All these ornies are from the 2007 JCS Christmas ornament issue. 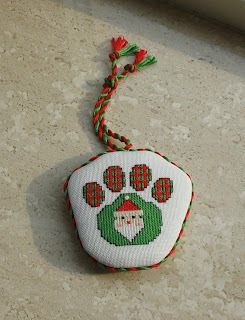 Freebie from Stitchy Kitty. Does this count as two ?! Here is my ornament for May. I didn't realise that this weekend was the SAL but luckily I had already finished this beauty last week. I changed all the colours to make it more tree-like! 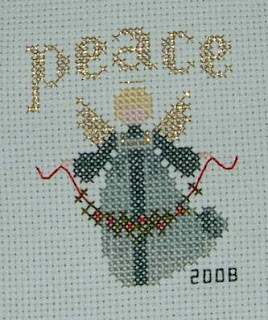 This is the design that I completed a while ago, but have only been able to finish as an ornament recently. 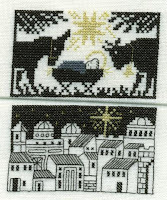 Here you can see two ornies from TPS I stitched for Jodi for our Smalls RR, it was a lot of fun. I stitched a second ornie because I had enough left over fabric after stitching the first one this month. This one is "Snowflake Heart" from Wild Heart Designs in JCS 2006 Christmas Ornaments. Once again, mystery cloth and mystery threads as I continue to shrink my stash. To give the design more depth, I used one strand each of two different colours. This weekend is our Stitch-A-Long Weekend! Don't forget this weekend is our Stitch-A-Long weekend for the month of May. Here in the US, it's also the unofficial start of summer with the Memorial Day Weekend, and many lucky stitchers will have Monday off as well. Have a great weekend and a Happy Memorial Day! Here is my May ornie. I think that I may have missed the month of April SAL because I was busier than all get out at the time. 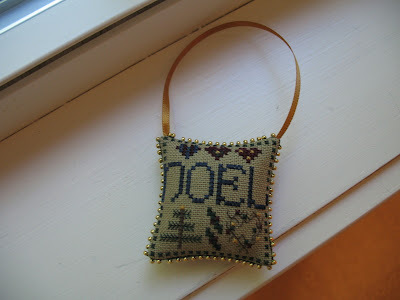 This one is called "Emblem of Friendship" and I found it in JCS 2006 Christmas Ornaments. A couple of cards from U.K. Cross Stitcher magazine. My blog is one of the featured sticthers for the month of May! Thanks so much, Jennifer. Finally here is a picture of my April Ornament. 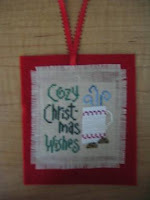 It is Cozy Christmas Wishes by Lizzie Kate. 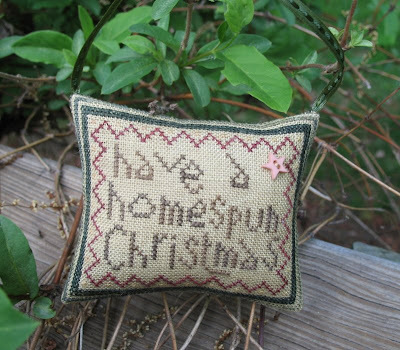 I stitched it on 28 count Permin Natural Lite Linen with GAST Fibers. It is backed with red felt. I have already mailed this off to a friend. 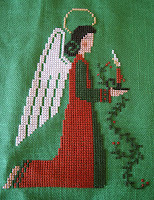 Stitched on Polstitches "Welsh Mist" (Dragon Shades) 28 count Jazlyn with DMC threads. Subbed the called for Rainbow Splendor with two strands of Dinky Dyes' "Icicle" stranded cotton (I'm pretty sure this was from a collaboration pack) and one strand of Petite Treasure Braid. 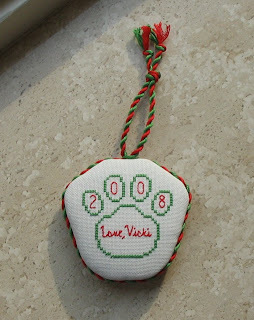 This is my first finish for the ornament SAL, I finished this one for April. 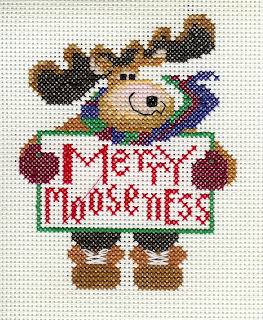 New Featured Stitchers, New Themes! I was a little startled when I realized this was the first day of May and I had to update the themes and the featured stitchers on the blog. 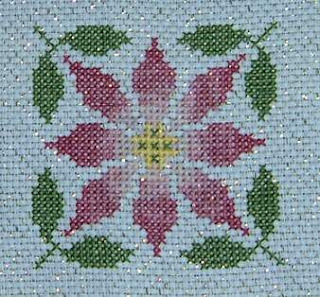 I've gotten the list of featured stitchers up, so feel free to check out their blogs and stitching albums. Don't forget - if you have an online stitching album or stitching blog that you'd like to list in our contributors section, please let me know. I'll make sure I get a link up so we can come and check out your work. As usual, I try to keep the list of blogs updated, so if you haven't updated your blog in four or more months, it will be removed from the list. It's not much fun for your fellow stitchers to check out an abandoned or empty blog. And if you switch blogging platforms, be sure to let me know the new address and I'll make the change. All active blogs (and stitching albums) are eligible for the Stitchers of the Month. The May Themes will be up a little later. It takes me some extra time to set that up, so I'm working on that now.